The standoff between a Philippine warship and Chinese ships is a reminder of South China Sea tensions. While international attention is focused on if and when North Korea will follow through on its vow to launch a satellite this week, another Asian hotspot is flaring yet again. The South China Sea, witness to competing territorial claims by Brunei, China, Malaysia, the Philippines, Taiwan and Vietnam, is seeing tensions escalate again with a standoff between a Philippine warship and two Chinese surveillance vessels. According to reports, the incident began Sunday, when a Philippine Navy surveillance plane spotted several Chinese fishing vessels in a lagoon at Scarborough. 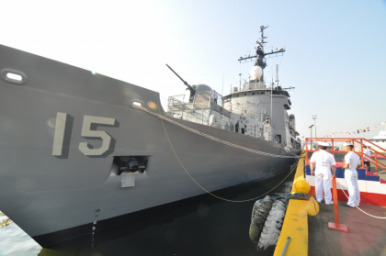 The news prompted the Philippines to deploy its largest warship, the BRP Gregorio del Pilar. On Tuesday, The Guardian notes that “Filipino sailors from the warship boarded the Chinese vessels for an inspection, discovering large amounts of illegally collected corals, giant clams and live sharks inside the first boat.” Two Chinese maritime surveillance ships later reportedly positioned themselves in between the Gregorio del Pilar and the Chinese fishing vessels, preventing the arrests of the fishermen. China has long been accused of using its fishing vessels as proxies for its Navy, and Beijing has often made little effort to rein in its vessels operating in disputed waters. Although the vessels typically have no official connection with the military, foreign officials have indicated there’s evidence that they sometimes coordinate their activities with China’s Navy. The irony in such comments, of course, is that China is quite happy to play by different rules when it suits. Only last month, 21 Vietnamese fishermen were detained near the Paracel Islands, a disputed area controlled by China but also claimed by Vietnam. Those arrests were only the latest in a string of such moves by Beijing, which has been increasingly willing to assert its territorial claims in the area. And how is the issue being viewed in the Philippines? I asked ASEAN Beat contributors Mong Palatino and Julius Rocas for their take on the incident, and whether the Philippine Navy was right to stand its ground. The idea of U.S. involvement was also picked up by Palatino. “I won’t be surprised if the incident will be directly or indirectly invoked by the government to justify more military exercises between the Philippines and the U.S.,” he added. One of the defenses of China’s actions regarding Vietnamese fishermen and elsewhere is that China doesn’t consider Paracel Islands disputed territory, so its actions are perfectly legitimate. But this is sophistry – the same could be said of any other nations’ claims. Willfully ignoring this reality will do nothing to advance a diplomatic solution. The current standoff is some way off of armed conflict. But it’s a reminder that things could get very ugly very fast in the region. The idea that Chinese strategists are too limited in their thinking to have a world-straddling navy is misplaced, argues James Holmes.